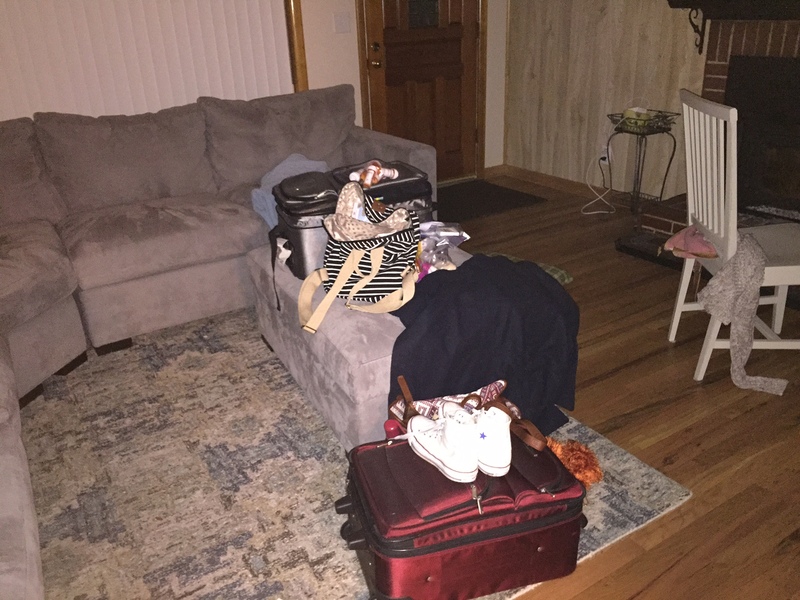 In the dim light of early morning, our luggage looks like an explosion in a clothes factory. We are ready to go. Our plane does not leave super early, though, so we will have time to eat breakfast before we go join my sister and nieces. My sister, Gail, has a work conference in San Francisco, so we are taking Ja’Ana, Alissa and Michaela down there for the ultimate homeschool field trip. Part of the time, we will all sight-see together. Part of the time, she will be involved with her conference and I will be the tour guide. We will all be very cozy in one hotel room every night, and will be riding public transportation instead of renting a car. For this and other reasons, J and I are each taking only one small suitcase that can be carried onto the plane and one backpack. We should have plenty of clothes, as we are only going to be gone for a few days. Rob, Lovana and Patsy will hold down the fort here, and Ron and Jake will hold down the fort at their house. I have a map of San Francisco in my backpack. Although I can get that information on my phone, I’m hoping to be able to see a larger version better. We have downloaded an app for the public transportation system, including the cable cars, onto each person’s phone and purchased a ticket for unlimited riding that can be used for the entire time we are there. We will just have to have the driver scan the phone, and can get on and off as much as we want. The hotel is near the cable car line, as well as the bus lines. We downloaded another app that tells us about many, many sights that can be visited in the city. We have chosen quite a few that would be fun for the girls and I to do. Most of them are historical museums. One of the things I have done with Ja’Ana and Alissa this year is study the great earthquake and fire of San Francisco in the early 1900’s. I hope to see some information about that at one of these museums, as well as some gold rush exhibits. We will be taking it easy, though, and will see what we see while still having fun, rather than run everyone ragged. Michaela, especially, can out-walk us all, but needs down-time each day. So, we will explore, then go back to the hotel and chill out. Then, the last day, my sister is treating us all to a tour. We will get on a bus and ride around, seeing sights, such as the Golden Gate Bridge and more. It should be a grand adventure! Sounds like so much fun! I like having some down-time, even on vacation. My kids have gone on a similar tour there with their grandmother and really enjoyed it. The best boat ride deal on the waterfront used to be to take the boat ride to Alcatraz Island,now a National Monument. My other favorite (cheap) thing was to go to Fisherman’s wharf and buy a cooked crab and a loaf of sourdough bread from one of the vendors and then walk up the hill to a park near the chocolate factory and have a picnic. Yum. Or, you used to be able to ride BART through the whole system for only about $1 — as long as you stayed inside the terminals you could get on and off trains as much as you wanted. Looking forward to seeing San Francesco very soon in person as well. How exciting for the girls! I hope to read about your adventures before we get there. You may have some great ideas of places for us to visit. Have fun, everyone!!! I was thinking of your upcoming trip! Wow… hope you all have lots of fun.. sending prayers for a safe trip.. If you have the opportunity to see Alcatraz go…it is very interesting. I hope you have a wonderful trip! I was not on-line while I was gone, so didn’t see this until after I got back. We just plain ran out of time to see everything. I saw them selling tickets to the Alcatraz tours, but we didn’t get to go this trip. Maybe next time.